A statewide downpour brought chaos to Californians this week, but it also provided some welcome relief to the state's 20 million residents who have suffered from drought conditions for more than four years. Add California Drought as an interest to stay up to date on the latest California Drought news, video, and analysis from ABC News. The record precipitation now has some experts declaring the drought over. The drought began in 2012, but California Gov. Jerry Brown did not declare a drought state of emergency until January 2014. A response team was later established, and state lawmakers have allocated over $3 billion for drought relief and water management improvements. 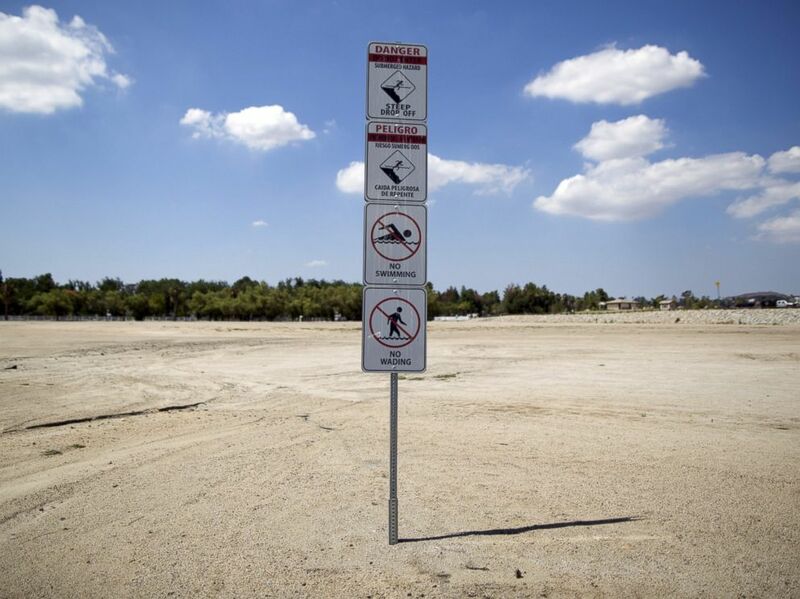 Signs warning of underwater hazards stand over a portion of dried up lake bed at Lake Elsinore in Lake Elsinore, Calif., July 23, 2015. The U.S. Geological Survey said 2014 was the warmest year on record for California. According to Park Williams, a climate scientist and an assistant professor at Columbia University's Lamont-Doherty Earth Observatory, the drought was exacerbated by high temperatures. "These last five years in California were much warmer than you'd expect just based on the drought alone, and the reason is because the globe's overall temperature has been warming," he told ABC News. "California's relationship with water is one where they either have too much or too little. So California goes through swings very rapidly. That's what made this drought in California so rare ... [it's] very rare to get five dry years in a row." 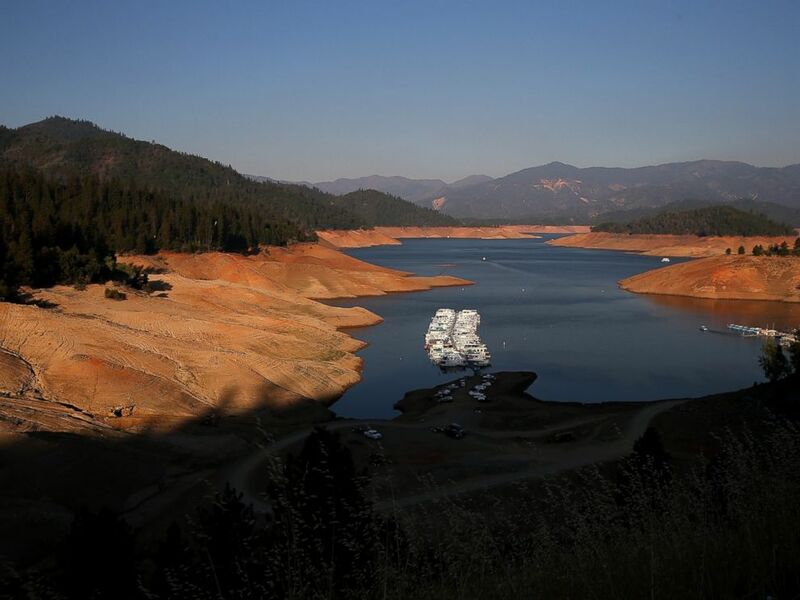 Houseboats are dwarfed by the steep banks of Shasta Lake at Bridge Bay Resort on Aug. 31, 2014 in Redding, Calif. when the lake reached about 30 percent of its total capacity, the lowest it had been since 1977. He added, "Global warming did not cause this drought but nevertheless had a measuring amplifying effect." Flooding warnings were in effect Tuesday in Northern and Central California after storms wreaked havoc on the Golden State last weekend. 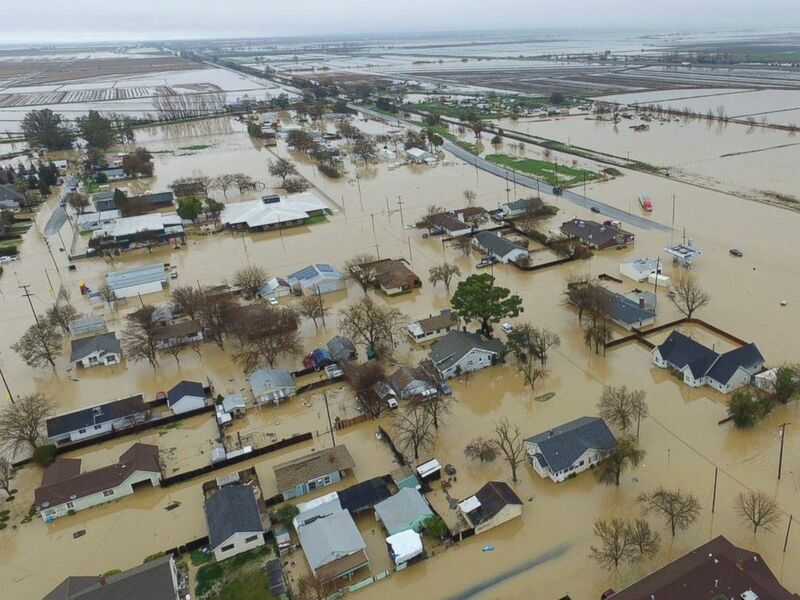 This aerial photo, shows major flooding in Maxwell, Colusa County, California, Feb. 18, 2017. A man walks through a flooded street in Salinas, Calif. on Feb. 20, 2017. In Modesto, police went door to door evacuating residents as floodwaters rose. In San Jose, firefighters jumped on inflatable rafts to rescue two people trapped by a roaring river. More than 2 inches of rain were recorded at the San Francisco International Airport on Monday. Since October, San Francisco has seen 25.6 inches of rain — nearly 2 inches more than the city usually gets in an entire year. 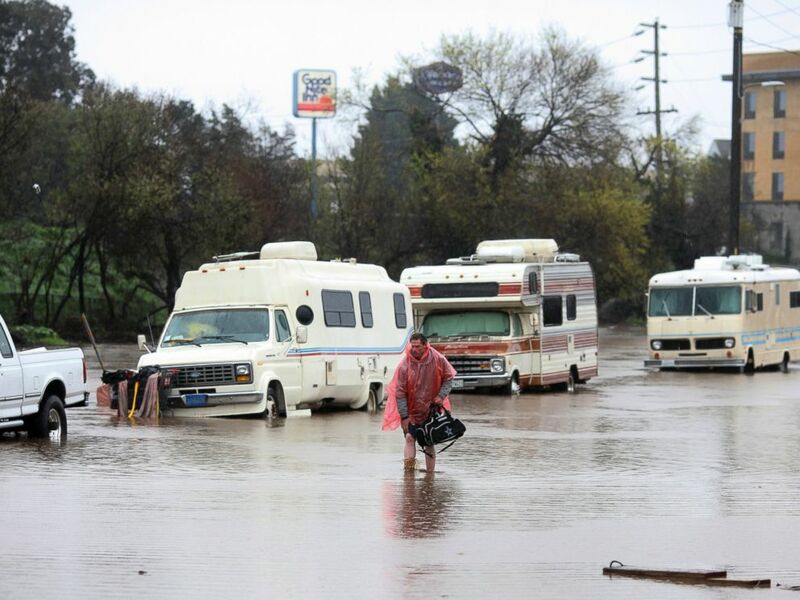 This extreme weather in Northern California came after powerful rain moved its way up the California coast; the rain first pounded San Diego and Los Angeles, stranding drivers in their cars and contributing to the deaths of least five people. 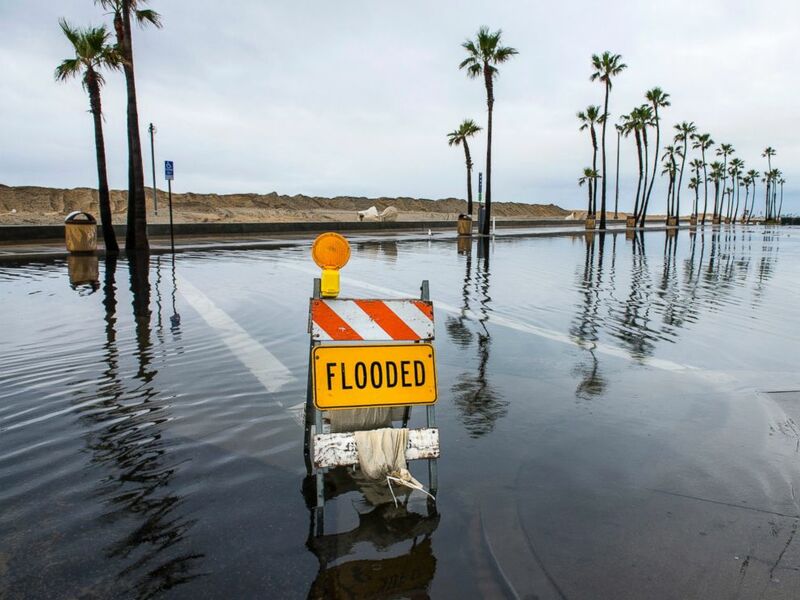 A sign lets visitors know that this beach-side parking lot near the Balboa Pier in Newport Beach, Calif., is flooded early Feb. 18, 2017. The latest drought outlook from the National Weather Service Climate Prediction Center "shows drought in Southern California likely to resolve and drought in the Central Coast region of California as persistent but improving." 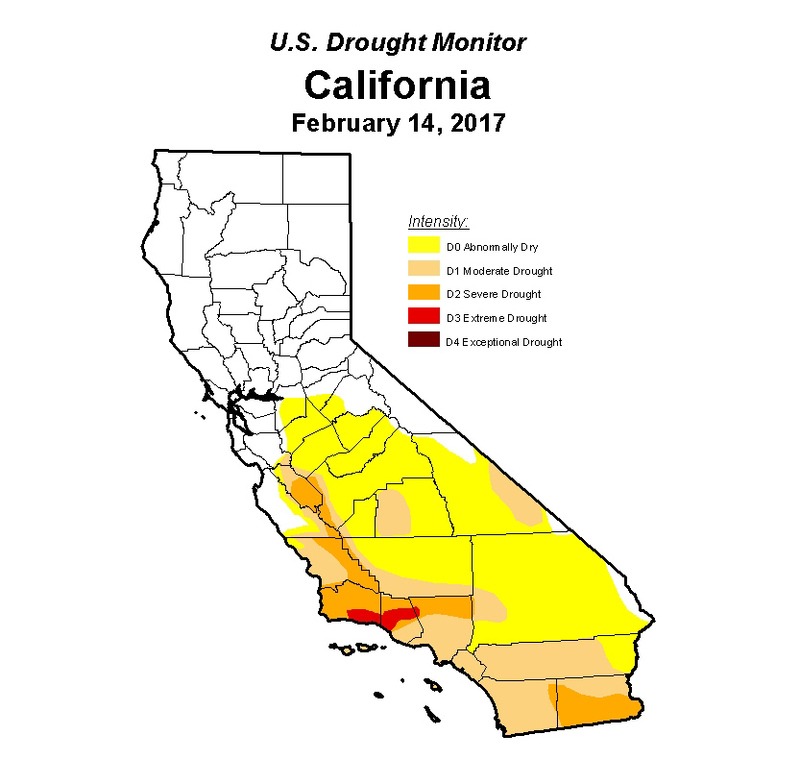 PHOTO: A U.S. Drought Monitor graphic shows the drought conditions in California as of Feb. 14, 2017. After this incredibly wet winter, Williams said, he considers the drought over; trees that survived the drought will likely begin recovering, and lakes are near capacity, he explained. Michael Dettinger, a U.S. Geological Survey hydrologist and a researcher at the University of California at San Diego's Scripps Institution of Oceanography, agrees with Williams' assessment. "I believe that the drought is over at this point," he told ABC News. "If groundwater levels were lower than they should be because of the drought, then we wouldn't need to say it's over. But groundwater levels are down because of overpumping that's been going on ... for 50 to 70 years. To me, that's not drought — that's just a long-term imbalance of how we use water." David Feldman, a UC Irvine professor of planning, policy and design, said he won't know if the drought is over until May, when the state's rainy season ends. "If I were regulator working for the state water board, I'd probably lean on the conservative side," he said. He added, "Things can dry out quickly. You can have a warm spell. You can have a warm period that melts snowpack in the [Sierra Nevada]. I think in May they'll have a good sense of if we can declare this thing over." Williams considers groundwater pumping — pulling water out of the ground, much of it by farmers so their crops can grow in dry conditions — a major issue in droughts. Groundwater is "essentially taking away from future water reserves to survive this current drought," he said. 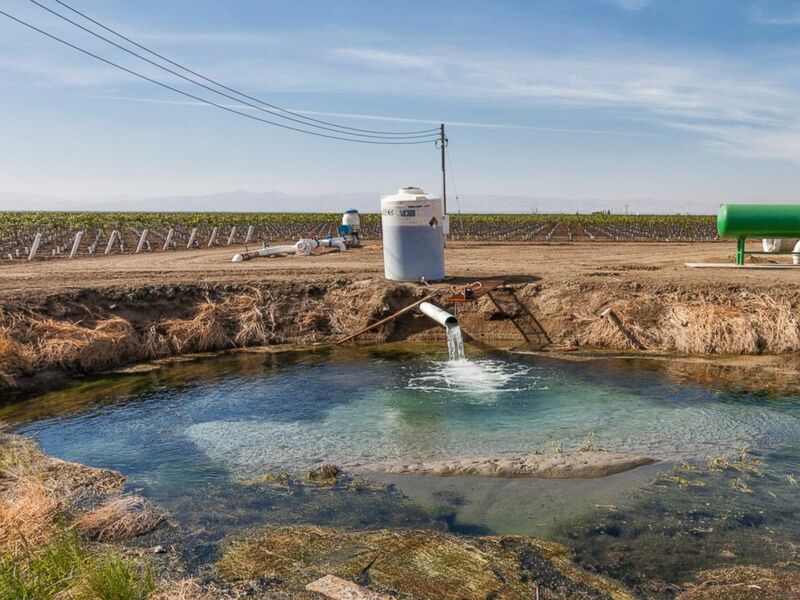 A groundwater well pumps water into holding pond at a family winery in the San Joaquin Valley, Calif., Nov. 4, 2014. Dettinger said groundwater was originally treated as a local issue. Now state lawmakers are enacting laws to improve how groundwater is monitored and managed. "That's I think one of the biggest things that came out of the drought, and it's a good thing. The other big thing that came out of the drought is water use restrictions and efficiency requirements were instituted," he said. "If we use less water, there will be more flexibility to carry us through droughts." California's water comes from three main sources: snowpack, reservoirs and aquifers, according to the Environmental Protection Agency. Californians use an estimated 108 gallons of water per person on average every day, the EPA said. Since 2012, the Golden State has endured not only record high temperatures but also record low levels of snowpack and precipitation, according to CaliforniaDrought.org, a project of the Pacific Institute, a nonprofit that researches solutions to freshwater issues, in Oakland. 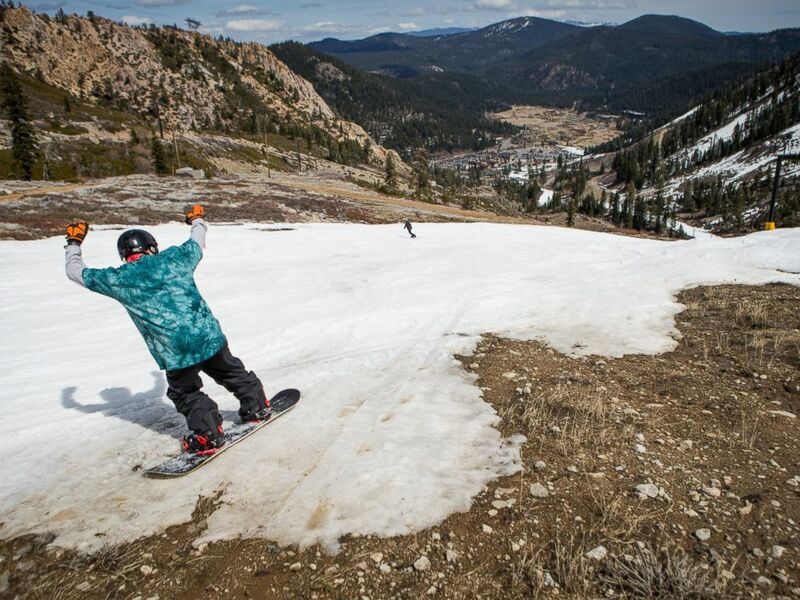 A snowboarder threads his way through patches of dirt at Squaw Valley Ski Resort, March 21, 2015 in Olympic Valley, Calif. The drought has hit rural communities harder than urban and suburban communities, which are better able to diversify their water sources, according to the Public Policy Institute of California. Most farming relies on irrigation, which accounts for approximately 80 percent of California’s human water use, according to the Public Policy Institute of California. In 2015 farmers had about 50 percent less surface water because of the drought; they pumped more groundwater to make up the difference but still had 10 percent less water than usual, and farm sector losses reached nearly $2 billion, according to the institute. Drought can be noxious to the environment. Wildfires could become more prevalent, and as many as 18 fish species could become extinct if the current drought continues, the Public Policy Institute of California said. 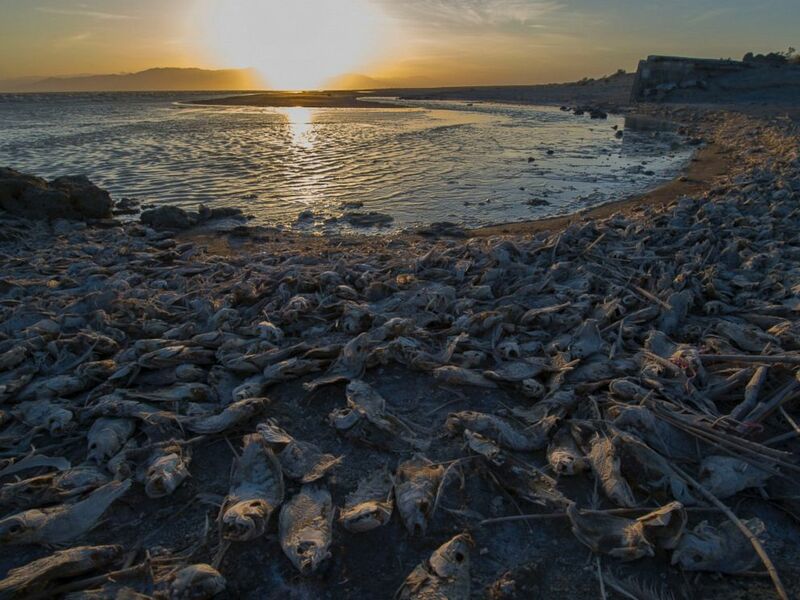 Dead fish are seen on the bank of Salton Sea, a saline lake in Southern California on April 29, 2016. Brown has issued a series of executive orders to help the state cope with the drought, the most recent mandating "continued, long-term water savings as drought persists." Nancy Vogel of the California Natural Resources Agency told ABC News that the governor will consider many factors when he revisits the emergency statewide drought declaration in coming weeks — including groundwater, snow pack and reservoir levels. This winter's rain "doesn't come all the time," Dettinger said. "The worst thing we can do is forget about droughts just because it's wet right now." He added, "Going forward, we definitely want to get a handle on the groundwater use because that is the piece that a winter like this can't even fix. We're going to have to fix it on our end by monitoring how much water we take. I would like to see them stop being called drought restrictions and call them sustainability restrictions." 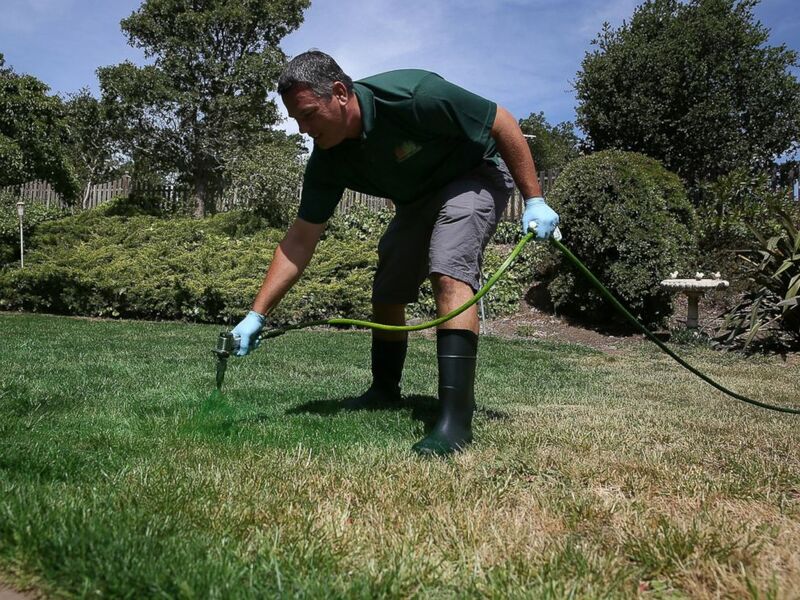 A man applies green paint to a brown lawn on May 29, 2015 in Novato, Calif.
Feldman said it's important to prepare for a drought before one is declared. He recommends that the U.S. follow Australia's example by harvesting rainwater and recycling wastewater. Most of all, he urged Americans not to take the nation's water for granted. ABC News' Morgan Korn, Jeff Costello, Lindsey Jacobson, Max Golembo and Melissa Griffin contributed to this report.